Do you have some great recipes that you want to organize or share? Would you like to make a cookbook? The Cookbook Template for Word is a great way to do these things. It is very easy to use and is customizable. You can download the Cookbook Template for free on this page. The Cookbook Template has many customizable sections for you to update and add to your liking. It has a table of contents, an introduction page, recipe pages, an index and clip art. First, decide what chapters you would like to add, appetizers, breads, pasta, etc. Then add these these to the table of contents. Next, write your introduction. Here is where you can tell your audience about yourself and your recipes. Next, you can fill out the recipe pages. Each page has two recipe sections and one section for the name of your chapter. There is space on each recipe page for you to insert a picture if you like. There are several clip art pictures for you to choose from. Then you can make an index. To add an index, mark the index entries in your cookbook, choose the index design, and then build the index. Gather all the recipes you wish to add to your cookbook. Organize them into categories such as appetizers, drinks, desserts etc. These categories will become your chapters. Organizing your recipes in this way will make it easy for you to build your cookbook. Your introduction is what is going to define your cookbook and set you apart from the crowd. Take time to think about why you are creating your cookbook and write out some bullet points. Then go ahead and get as creative and personal as you like. You can use the template to create a cookbook for your own family recipes for your own reference or to give out at family reunions. You could add family members pictures to the recipe pages. The template could be used for a cooking blog. You can customize it with your own logo and artwork. You could also make a e-book cookbook or a printed cookbook. 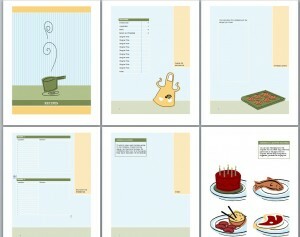 Whatever type of cookbook you would like to create, you can do it with the Cookbook Template.